After you generate a schedule, you can easily make manual changes to fill any remaining open slots or to remove a minister from a filled position. 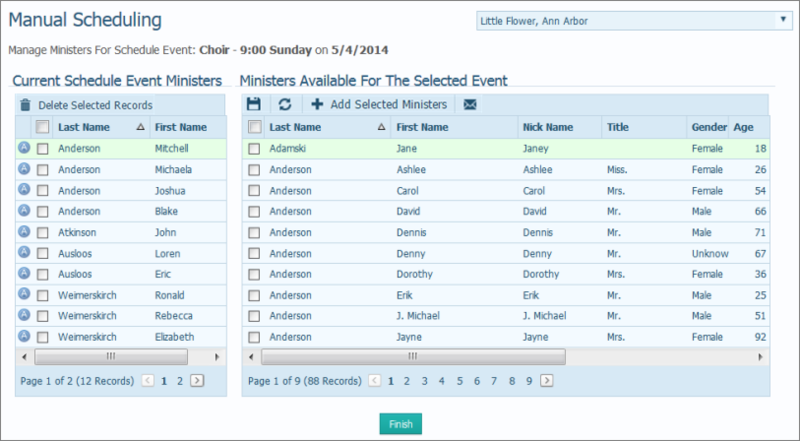 Use the following procedure to add specific ministers to an event and remove ministers who are already scheduled. Click Scheduling to display the Scheduling page. For the desired event, click . The Manual Scheduling page is displayed. The page shows you a list of ministers who are currently scheduled and a list of ministers who are available to serve at the event you selected. From the list of available ministers, check the box to the left of each minister that you want to add (you can check more than one). Then, click +Add Ministers . A message is displayed to let you know how many ministers were added to the schedule for the event. The ministers you selected are added to the Current Schedule Event Ministers in the left panel. This icon is displayed next to the minister's name to let you know that the minister was manually scheduled: . From the Current Schedule Event Ministers list on the left, check the box to the left of each minister that you want to delete (you can check more than one). Then, click . A message is displayed asking you to confirm the deletion. Click OK to confirm the deletion. Then, click OK to dismiss the message informing you that the minister was removed from the schedule. When done, click Finish to return to the main Scheduling window.